Sometime over the last couple of years I visited my friend “K,” and tested her family’s everyday household things for Lead and other toxicants (that’s a big part of what I do to help families who have concerns about Lead exposure). 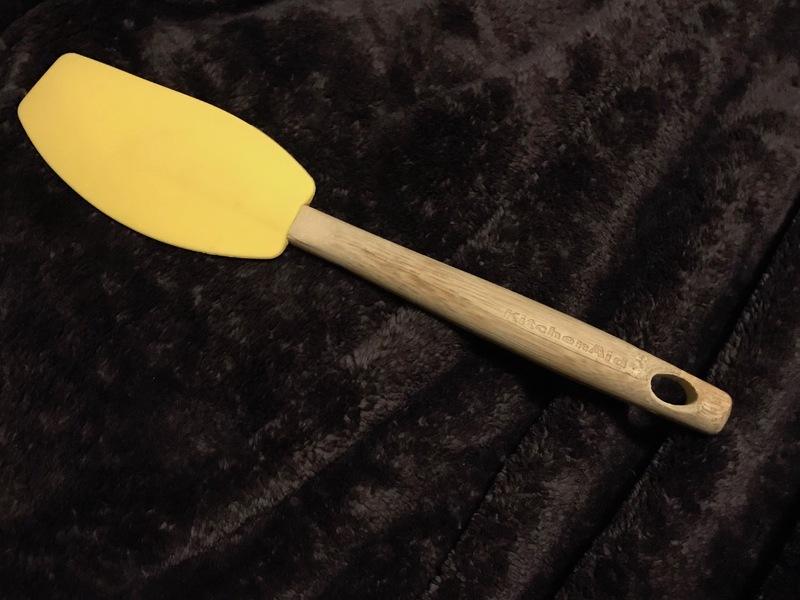 One thing I found at her house was a distinctive spatula – featuring an unusually-long, curved “banana-yellow”-colored blade, with a round wooden handle, just like this one (pictured above). The XRF instrument revealed it to have high Lead content. When I was visiting with her it didn’t occur to me to ask her if I could have it to report on for my blog; however, about a week after our visit I called her and asked her what she did with it, and if she could possibly save it for me for my growing assortment of examples of “Leaded household products” I was starting to collect to share with other parents. She said she had already thrown it out — DARN! Since then, I have tested – among the countless array of items in people’s kitchens – probably hundreds of spatulas…and I have not ever found high levels of Lead in any other silicone spatula (which is GOOD news, of course!) However, during testing parties I often tell the story of that friend’s distinctive banana-yellow spatula – the only spatula I have ever tested that was positive for high levels of Lead [I hadn’t recalled noticing a particular brand-marking at the time]. Here’s a link to this product in red on Amazon. I will post test results when I have that available. At a m0re recent testing party, I shared that story (as I have many times, as a cautionary anecdote) — and one of the mamas said that SHE had a spatula that she thought matched that description: round wooden handle; long curved rubber blade; “banana-yellow”! As luck would have it, I was scheduled to be in the area for a few more days, and so found an opportunity to visit her at her home later that week, and when she proudly produced her very own “banana-yellow” spatula it did indeed seem to be a dead ringer for that oddball one I had tested years ago! I realized at that moment that I was torn — hoping on the one hand that this woman’s spatula was negative for any toxicants, of course — but at the same time hoping I had stumbled upon another genuine specimen of the fabled outlier — the crazy banana-yellow spatula that tested positive for high levels of Lead! I tested her spatula and “WHAMMO!” — super-high Lead! She graciously offered it to me for my collection, to photograph and to share with everyone on my blog! To recap: this is the only color silicone spatula that I have ever tested that has been positive for Lead above a trace amount (and most silicone spatulas do not even have a trace amount of Lead.) Based on my now pretty vast spatula testing experience (lol), and my recollection of K.’s spatula, I think hers may have pretty likely been the same brand – and possibly even the exact same design from the same year (I will ask her). As I scrutinized this one, I was just floored when I discovered this was a KitchenAid product! With their ongoing denial of the unsafe levels of Lead found in their mixer paddles – I was not surprised to find another KitchenAid product with Lead — but it just cements my concern for their brand as a whole – which people perceive as being “pedigreed” and “the ‘top-tier/ high-priced option’ — but worth it.” And so we learn (as with many other home products)… high-priced does not necessarily mean non-toxic! Continue reading below for the full XRF test results for this particular spatula pictured here… and PLEASE write a letter of complaint to KitchenAid and ask them to change their attitude regarding manufacturing processes for kitchen products (past and present!) that needlessly include any amount of the potent human neurotoxicant, Lead <sheesh>! Click here to see more KitchenAid products I have tested. Click here to see more silicone spatulas I have tested. The amount of Lead that is considered toxic in an item intended for use by children is anything 90 ppm or higher in the paint or coating or anything 100 ppm Lead or higher in the substrate. There is currently, in the U.S., no regulation limiting total Lead content (as detectable with an XRF instrument) for food-use spatulas (nor for any kitchenware for that matter). There should be. Our restrictions for food use products should be AT LEAST as strict as our restrictions for products for children — after all, our children eat the food we make with these items. As always, please let me know if you have any questions. I hope you are as outraged by the absurdity of this as I am. After all, as repeatedly stated, theirs is literally the only example of a high-Lead-content kitchen spatula I have ever found.